Below is the 2014 first quarter report from the SW Idaho Chapter of the National Association of Residential Property Managers. 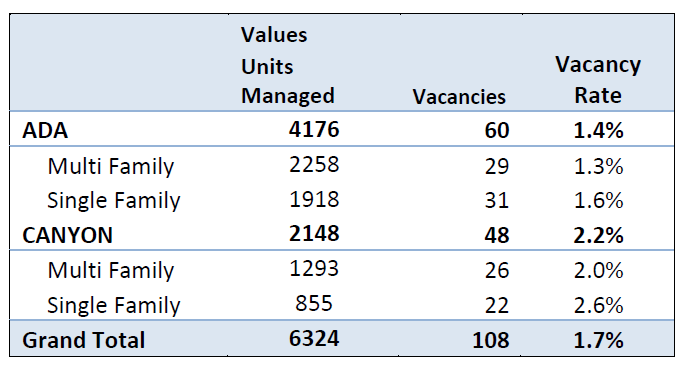 The report shows that vacancies in both Ada and Canyon County vacancies have dropped below 2% for single family rentals as well as multi-family rentals. The report also shows a nice steady climb on rents across the board with only minor exceptions, which I credit to skewed numbers from a small sample size. All in all, the numbers are very consistent with what we have been reporting. There are at least another 2521 multi-family units being built within Boise and the surrounding areas this year, so like last summer, First Rate Property Management is proceeding with some caution, as the increase in supply could affect the market. So, we continue to offer 2 year leases as an option to help smooth out any abrupt market changes. 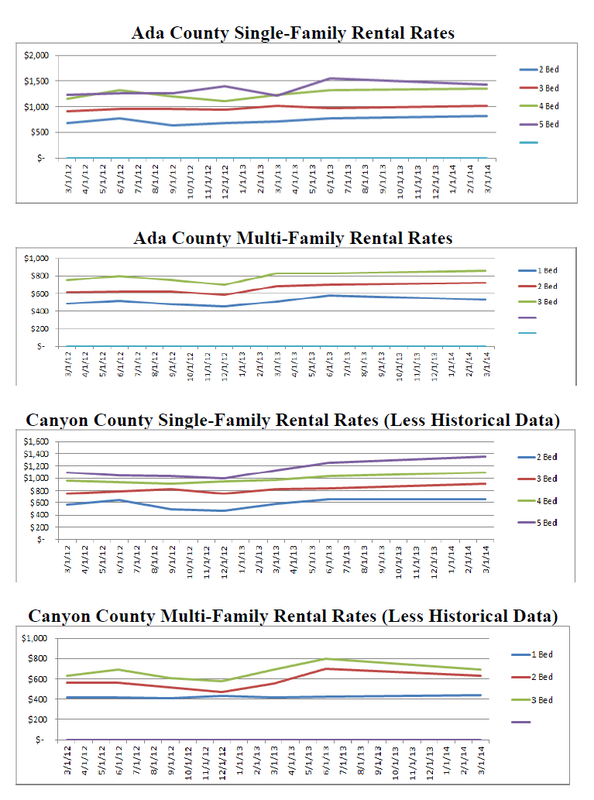 The purpose of this survey is to show vacancy and rental rate trends among single-family homes and multi-family units (2-15) in Ada and Canyon County. 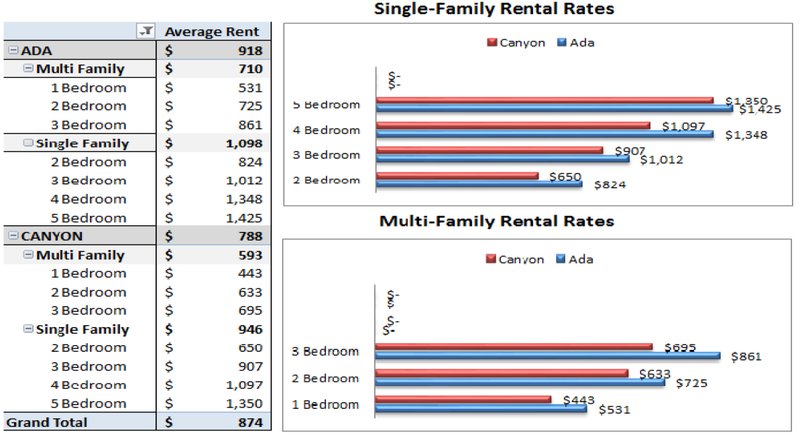 Survey results are displayed by type (single or multi-family) and bedrooms (1-5) for the respective county. Property status was surveyed as of March 31st, 2014. Data from a total of 19 property management companies were included in the survey results, which accounted for a total of 6324 homes: 2773 single-family and 3551 multi-family. The accuracy and reliability of this survey is improved with an increased sampling. Vacancy rates moved downward 2.2% from last quarter. Comparing spring to spring, the surveyed vacancy rate dropped from 2.6% for Q1 of 2013 to 1.7% for Q1 of 2014, with a recent reduction in single-family vacancies for the quarter. Rental rates also rose significantly, as the supply of homes increasingly comes closer to falling below the demand. Spring rate increases are historically higher than the winter months, however, comparing last year's data, we have already reached Q2 of 2013 rental rates. Multi-family rates were relatively stable with some segments slightly up and some slightly down within the statistical variability of the survey. Most of the upward rental rate movement for the quarter was in the single-family market. The SW Idaho Chapter of NARPM invites you to learn more about the National Association of Residential Property Managers and the educational resources provided to help you run an effective, professional, and ethical property management business. Visit our website to view upcoming and past events and feel free to contact one of our chair members with any questions or stop by one of our meetings.